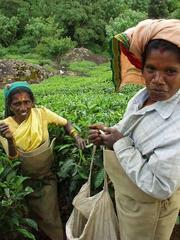 Tea picking ladies, Tata tea plantation, Munnar. The bus ride from the plains of Kerala up into the Western Ghats, the moutains that line the southwest coast of India, took my breath away: partly from awe at the view out the window, and partly from fear that the bus would drive off of the precipice at the side of the road. Out the window the trunks of palm trees, less than a foot thick, rocketed up a hundred feet from the valley floor, exploding into a green burst of leafy fronds. Far below them short shrubby trees grew like oversized broccoli. In the last ten miles before arriving in Munnar, a town with some of the highest tea-growing estates in the world, wisps of fog began to lace the hills, and the tea started. 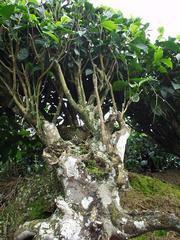 Tea grows on trees that are kept trimmed low, so that they look like bushes; in the Western Ghats, they grow those trees like Hoosiers grow corn. Unlike the Midwest, however, the topography of the Ghats gives vantage points that make it possible to more fully appreciate the magnitude of the agricultural enterprise taking place. The trees are organized into clusters just the right size for tea leaf pickers to be able to reach around them, with thin little pathways weaving between them. From on high, the effect is that of driving over an enormous green fish, its scaly side reaching out as far as the eye can see. The proprietor of Zina Cottages in Munnar, Joseph Iype, made me a hand drawn map of a hike that led through the nearby plantation of the stuttering Tata Tea Corporation. The long winding path dove into the green scales of the tea trees, where "tea ladies" (as Joseph called them) navigated the lanes betwen them and plucked tea, two leaves and the bud from each branch. Up close, it was possible to see the age of the trees: they had orange and white lichens growing on their trunks and on the gnarled roots that clawed at the sloped ground. High quality tea trees - Darjeeling or Assam are the most common varieties - do not start producing until at least five years after planting, but they can live for up to one hundred and fifty years. Later, a guide who was leading me through another part of the Ghats pointed out quick growing plants, much more spindly and frail, that he said could be harvested in two years but died in sixty. The next day, three Germans who were also staying in Joseph's cottage had hired a car to see the area. There was an open seat, so I joined them. We drove to Ervikulam National Park (the entrance sign was typically baroque Indian English, as if the writer had to fulfill an obligation to his thesaurus: This is the habitat of wild denizens seeing animals is a matter of chance) which is home to the amazingly tame Nilgiri Tahr, a kind of mountain goat. It was possible to walk within ten feet of them, at which point they would finally start to meander away. Next came the highlight of the day, a stop at the Talliar tea factory, where we saw tea being processed. For all but the highest grades of tea, the leaves were dried, chopped, the stems and veins removed by statically charged rollers, then fermented, dried, and sorted by grade by a large vibrating chute with wire mesh of descending size lower down; little waterfalls of tea fell from the side of it into large tin bowls. Processed tea lay in mounds on the floor, three feet high and ten around, and there were rows and rows of canvas sacks that were filled with it. A week later in Ooty, also in the Western Ghats, I saw another factory, where they showed us machinery that processed whole-leaf tea, for the premium grade; they were gently crushed in a manner that released the leaves' juices but left the leaf intact. On the drive back, the tea ladies were still picking in the hills and sorting the harvest on the side of the road, there was another factory fermenting and drying, with trucks hauling in large bales of tea leaves for processing. Most days at work in the United States, I drank Darjeeling, Earl Grey, and English Breakfast, but I hadn't had much of an idea where it had come from until I visited Munnar.